Raccoons are important furbearers, providing income and recreation to hunters and trappers in New York State. Many people enjoy watching or photographing raccoons. Some people feed them, but this is unnecessary and unwise. Keeping raccoons as pets may be harmful to both humans and raccoons, and is illegal. Raccoons are among the most widespread mammals in New York State. The adaptable raccoon can be found everywhere, from the most remote forest to the crowded inner city. Raccoon populations often are more dense in large cities than in the wild, but abundance varies widely in different types of habitat and different parts of the state. Raccoons feed mainly at night. They eat fruit, nuts, berries, small animals, and insects and also will feed on pet food, garbage, and garden crops. Roundworm infects most raccoons in New York at some time in their lives. The roundworm rarely causes the raccoon any problems, but the animals pass large numbers of eggs to the environment. Eggs ingested by another animal may hatch and cause nerve damage. Raccoons are protected by law. 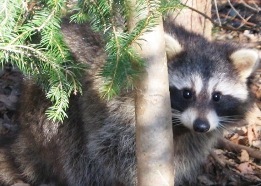 No one may possess a raccoon without a license, and licenses are not issued for pet wildlife. Hunting or trapping raccoons requires a license. The law allows unlicensed homeowners and farmers to destroy raccoons that damage property. However, property owners should try eliminating food and shelter before killing the animal. Except where temporarily reduced by rabies or distemper, raccoon numbers may be very high. While densities in rural areas may be 20 – 40 raccoons per square mile, raccoon densities in some developed parts of the state (e.g. Long Island) may exceed 100 per square mile. Nuisance wildlife control persons licensed by New York State can be hired to deal with problem raccoons. Click here for a list of Licensed Nuisance Wildlife Control Operators (NWCOs) near Upper Brookville. Note that Nuisance Wildlife Control Operators are private business owners licensed by DEC to handle and remove wildlife issues in and around your home. NWCOs charge a fee for their services. Before hiring, follow the same measures you would when contracting with anyone to work around your home.